Researchers are creating a system that harvests heat from an engine's exhaust to generate electricity, reducing a car's fuel consumption. The effort is funded with a $1.4 million, three-year grant from the National Science Foundation and the U.S. Department of Energy. A Purdue University team is collaborating with General Motors, which is developing a prototype using thermoelectric generators, or TEGs, said Xianfan Xu, a Purdue professor of mechanical engineering and electrical and computer engineering. TEGs generate an electric current to charge batteries and power a car's electrical systems, reducing the engine's workload and improving fuel economy. The prototype, to be installed in the exhaust system behind the catalytic converter, will harvest heat from gases that are about 700 degrees Celsius, or nearly 1,300 degrees Fahrenheit, Xu said. Current thermoelectric technology cannot withstand the temperatures inside catalytic converters, where gases are about 1,000 degrees Celsius, he said. However, researchers also are working on new thermoelectrics capable of withstanding such high temperatures, a step that would enable greater fuel savings. The project begins Jan.1. The first prototype aims to reduce fuel consumption by 5 percent, and future systems capable of working at higher temperatures could make possible a 10 percent reduction, said Xu, whose work is based at the Birck Nanotechnology Center in Purdue's Discovery Park. The research team, led by Xu, involves Purdue faculty members Timothy Fisher, a professor of mechanical engineering; Stephen Heister, a professor of aeronautics and astronautics; Timothy Sands, the Basil S. Turner Professor of Engineering, a professor of materials engineering and electrical and computer engineering, and executive vice president for academic affairs and provost; and Yue Wu, an assistant professor of chemical engineering. The thermoelectric material is contained in chips a few inches square that will be tailored for their specific location within the system. "They are optimized to work best at different temperatures, which decrease as gas flows along the system," Xu said. The researchers are tackling problems associated with the need to improve efficiency and reliability, to integrate a complex mix of materials that might expand differently when heated, and to extract as much heat as possible from the exhaust gases. Thermoelectric materials generate electricity when there is a temperature difference. "The material is hot on the side facing the exhaust gases and cool on the other side, and this difference must be maintained to continually generate a current," said Xu, who has been collaborating with GM in thermoelectric research for about a decade. A critical research goal is to develop materials that are poor heat conductors. "You don't want heat to transfer rapidly from the hot side to the cool side of the chip," Xu said. "You want to maintain the temperature difference to continuously generate current." Researchers at GM are using a thermoelectric material called skutterudite, a mineral made of cobalt, arsenide, nickel or iron. "The biggest challenge is system-level design - how to optimize everything to get as much heat as possible from the exhaust gas," Xu said. "The engine exhaust has to lose as much heat as possible to the material." Rare-earth elements, such as lanthanum, cesium, neodymium and erbium, reduce the thermal conductivity of skutterudite. The elements are mixed with skutterudite inside a furnace. Because using pure rare-earth elements is costly, researchers also are working to replace them with alloys called "mischmetals." 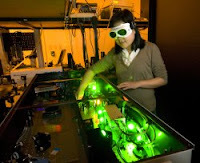 The work builds on previous research at Purdue involving the National Science Foundation, the Defense Advanced Research Projects Agency, the Air Force Office of Scientific Research and the Rolls-Royce University Technology Center. Findings, as well as teaching- and research-oriented materials from the project will be provided via websites including Purdue's nanoHUB and thermalHUB Web portals. The research will provide graduate and undergraduate students with training in interdisciplinary areas and industrial experience through internships. Thermoelectric technologies also might be used in other applications such as harnessing waste heat to generate electricity in homes and power plants and for a new type of solar cell and solid-state refrigerator, Xu said. We know the self-induced currents (inductance) in a solenoid or electromagnet, and as a consequence, it changes polarity, an issue not taken into account, but if its thermal effect (eddy currents) as well, taking into account first, and trying to exploit this phenomenon, as an attribute or benefit that applied in the operation of the new generator that consists of two rotors and two stators would be able to open a new era ... ... .. I need company or institution that is interested in it, I have no means to pull it off.